One day before fight night, the final act of theater. If the prefight weigh-in serves an important function for the boxers, a final opportunity to ensure that each man has trained to perfection, that both have met their contractual obligations and that neither will carry an unfair weight advantage, it also offers each man a final opening to assert psychological dominance, by staring into his opponent’s eyes and seeking to divine his level of anxiety. For the promoters, meanwhile, it is the chance to make one last sell, to increase interest and hype up the fans. The fans obligingly play their part, lining up en masse hours in advance to catch a glimpse of the combatants up close, 6,000 or so filling seats in one half of the MGM Grand Garden Arena. One by one, young and old, active and retired, professional prizefighters in attendance are brought up on stage and introduced to the crowd: Abner Mares, Danny Jacobs, Danny Garcia, Seth Mitchell, Adrien Broner, Bernard Hopkins, Erik Morales, and even Leon Spinks. Then Saturday evening’s participants step on the scale. Surprisingly, Shane Mosley is one half-pound over the 154 lb limit for his clash with Saul Canelo Alvarez, who weighs in at 154 on the button. Mosley is surprised; on another scale, he said, he tested himself and was right on 154. No matter, he shrugs, he’d lose it easily, and sure enough, within a half hour he does. The crowd roars as Miguel Cotto arrives, and boos in anticipation and upon the appearance of Floyd Mayweather. Mayweather, the challenger, steps on the scale first; at 151, he is the heaviest he has ever been, one pound more than he weighed when he fought Oscar De La Hoya five years ago. Cotto hits the 154 limit on the nose. The two men pose face to face. They stand inches apart, staring into each other’s eyes. They stare. And stare. And stare. 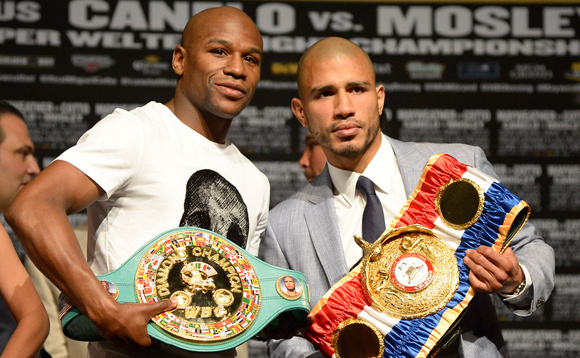 Neither moves, neither yields an inch, Mayweather chewing gum, Cotto with ice running through his veins, unmoving. As their handlers begin to move pull them apart, the roars of the crowd echoing through the arena, the two men start jawing at each other, Cotto in particular straining at the leash and shouting across at his foe as camp members ease their men in different directions. “I told him he’s facing the best,” says Mayweather afterward. “I said he’s undefeated, but he hasn’t fought Miguel Cotto,” counters Cotto. Watch the slideshow on HBO.com.